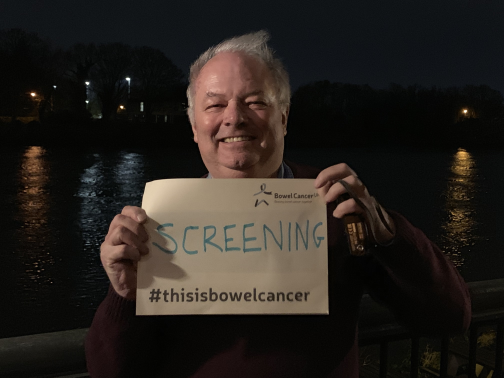 Bowel Cancer UK lay review panel member and volunteer, John Marsh, tells us about his own experience of bowel cancer and how he’s now helping shape future bowel cancer research. I’m John Marsh, I’m 72 and I’ve lived in Battersea since the week of the Hurricane in 1987. I’ve got two children and, so far, three young grandchildren - I like to think the fact that their most common words are ‘how’ and ‘why’ may mean they take after me a bit. I spent most of my career around the publishing and consumer data industries and so worked in ‘Big Data’ before the term was invented. I think that has led to some of my interest in cancer research. All was well until soon after my 61st birthday when I got a letter about the bowel cancer screening test. I’d never heard of it before but, without doubt, that was my luckiest-ever day. I didn’t hesitate to take the test and a few days later I got a letter inviting me for a colonoscopy. Six or seven years ago I read about the Bowel Cancer UK awareness talks and thought I would give it a go. I do about one talk a month now and I still enjoy the variety of people I get to talk to. A couple of years later I became a patient rep for Cancer Research UK. That’s when I started to learn about research and the importance of early diagnosis in improving survival rates. That’s also when I learnt about the potential for data-driven research to identify those people at most risk of cancer and to investigate diagnostic tools and potential new treatments. Given my background in ‘Big Data’ that became a big interest and it has led to my interest in research. What does patient and public involvement mean to you? That’s a hard question! I find it’s about working with top consultants, top civil servants, top NHS people and charity leaders to make sure that they don’t just think about cancer, but also consider people with the cancer. Miracle cures are little good if they destroy people’s quality of life. Most of the professionals I have dealings with are fully in agreement with that, but you do find the occasional researcher who is so excited about their research they sometimes don’t give enough thought to the people involved. As a patient rep I think one of our key duties is to encourage that excitement, but make sure the practical impact on the patients involved is fully thought through too. As well as making sure the research focuses on those things which will have the biggest positive impact on people’s lives. At the moment I’m one of the two patient reps on the steering group of the National Cancer Diagnosis Audit. That’s a project which brings together GP and hospital data about patients who are diagnosed with cancer. The audit aims to improve the processes before diagnosis and identify cancer patients earlier. I think I have helped shape some of the questions to be more patient-impact focused. Last year I got involved in drafting the lay summary of the report and the overall foreword. I think it’s really important that the general public knows about and understands the value of this sort of research. I’m just about to attend my first meeting as a patient rep on the Bowel Cancer UK Lay Review Panel, which provides advice on funding for research projects. I’m hoping I’ll get by with asking a few short, simple questions beginning with ‘how’ or ‘why’! How do you think you have made a difference by becoming involved in research? My first research project was a joint Cancer Research UK and Macmillan project looking at public attitudes to the use of their data in the Cancer Registry. I got involved in shaping the research and in the ‘consumer’ panels we ran across the country. I think I helped make the researchers start with a much more basic level of information. I had learnt this was necessary from giving my Bowel Cancer UK awareness talks.